Why would you want send anonymous email? Perhaps to signup to various web services, report illegal activity, confess your love to someone, warn people or just play a joke. Ok, there's various ways to signup for a temporary email address online which doesn't ask too many questions, but in this case we want to talk about keeping your email private while it's in transit. It's no secret that meta data collection by various authorities is really useful - who's emailing who, from what IP address and what time etc. This is all part of an email header when an email is sent and received. Normally you can't see this unless you know where to look. An email header contains a lot of information and usually looks something like this. At first glance it looks like a bunch of random stuff, but looking closer it gives a lot of information about who the email is from, when it was sent, the path it took to get to the recipient and when it was delivered. But really, this is no-body's business but your own. Using EncryptUs you can not only hide the content of your emails, but you can also obfuscate (that's a fancy word for mask) the header information. EncryptUs has an option to completely anonymize the header of an email when it leaves your computer, and then re-assemble the header when it reaches the recipient. Not only that, your email will be bounced around the world between different and random servers and the header constantly changing so it cannot be tracked or identified where it ends up. 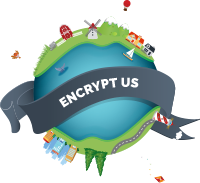 EncryptUs uses strong end to end encryption to guarantee safe passage of your confidential email messsages. Not only that, when you use EncryptUs you don't need to change anything about the way you send and receive email - it's all automatic. Plus, EncryptUs is free to use.